Laser Hair Removal is achieved by using a laser that seeks the pigment that is in the hair shaft and the root bulb of the hair. The laser causes a thermal injury to the root bulb which destroys it so that it can not produce another hair follicle. The Cutera Xeo is used for this process, and all the other laser procedures below. Intense Pulsed Light (IPL) is used to lighten or remove unwanted pigmentation, such as age spots (solar lentigines) and red pigmentation such as rosacea. The patient should not tan and should allow their skin to be as light as possible before this process, so that IPL will seek the age spot, while providing minimal treatment to the surrounding areas. Laser Genesis is a process used to increase collagen, prevent fine lines, and help reduce the diffused redness that occurs with rosacea. This is a warm, painless, process that is very relaxing. Laser Vein Removal can be used for spider veins of the legs and small broken capillaries (telangectasias) of the face and legs. 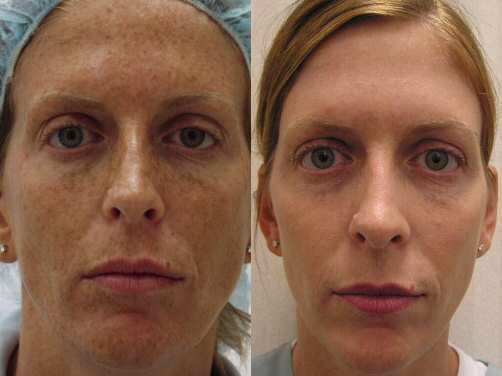 The skin should be as light as possible without a tan for treatment.